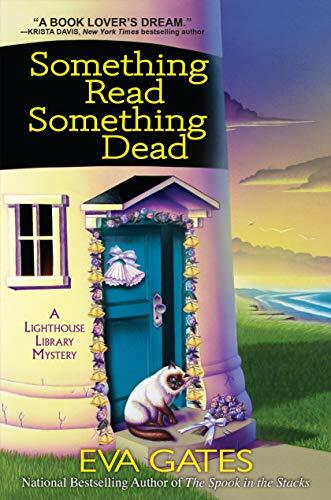 Eva Gates’ newest book, Something Read, Something Dead, of the Lighthouse Library Mystery series, is well plotted and a fun read. A typical cozy mystery, there is no overt violence, but the crime is there nonetheless. Lucy Richardson, the protagonist, lives and works at the Bodie Island Lighthouse at the Outer Banks of North Carolina. Her family lives in Nags Head, and she has found a comfortable life for herself with her aunt and uncle and her favorite cousin, Josie O’Malley, and her many friends. Lucy and her friends are planning a small, intimate wedding for Josie and her fiancé, Jake Greenblatt, when a crisis strikes. Josie’s grandmother on her father’s side, upon hearing about the wedding, has decided that it must be an affair of great scope, and that she, Gloria O’Malley, is the only right person to plan it. When Gloria descends upon the family from New Orleans, the best-laid plans begin to go awry. Gloria’s daughter, (Josie’s aunt) Mary Anna, and Mirabella, the granddaughter of Gloria’s brother Clive, and Florence, granddaughter of Gloria’s youngest brother, are formidable foes. It’s a family affair of gigantic proportions when these women, as Josie describes them, “the Louisiana Mafia,” arrive to take over. Florence and Mirabella have entered into a partnership—that is, Mirabella has taken over Florence’s small, event planning business, pushing Florence to the back of the bus, so to speak. A wedding shower is planned, to be held at the library, and Josie, who owns Josie’s Cozy Bakery (a popular local retreat) is baking her own treats for the event. Mirabella, always demanding, informs Josie that she only eats gluten-free foods, and Josie reluctantly agrees to bake special for Mirabella. The day arrives and the guests gather. The food is scrumptious, and even the gluten-free foods look good. A good time is had by all, until the end of the event, when Mirabella takes ill and dies before getting to the hospital. Detective Yarmouth of the state authorities is directed to handle the investigation since the local authorities are too close to those involved. As the investigation into Mirabella’s death progresses, the authorities discover she was poisoned, and since she was the only one to consume the gluten-free food, that is tested and found to be the culprit. Yarmouth turns his focus on Josie since she baked the goods, and in her frustration with Mirabella for attempting to change a small, intimate wedding into a statewide event, she threatened the woman. Lucy takes it upon herself to investigate and prove her favorite cousin innocent of the crime. As she probes into the death, she begins to believe that the poisoning was designed to cast a dark light on Josie. Although ignored by Yarmouth, numerous other characters surface as possible suspects in Lucy’s mind. Jake’s ex-girlfriend, Toni, appears wanting to reconnect with him; Blair, one of Josie’s employees is almost terminated for bad behavior. Both of these people look good to Lucy, especially if her theory is correct. In the meantime, another crisis arises: a large crack develops in the foundation of the historic lighthouse and restoration costs pile up. While Lucy and her coworkers work feverishly to raise money, the alternative is not promising. Lucy engages her friends, Stephanie (a lawyer) and Grace, to assist her in her investigation even as Detective Yarmouth warns her against getting involved. This does not stop Lucy, even when her own life is placed in jeopardy. Throughout the story, Gates inserts small clues that are almost overlooked by the reader, but by the end of the story prove to be vital to solving the crime. The primary characters—Lucy, Josie, Jake, Gloria, Toni (Jake’s ex), Bertie (Lucy’s boss), and Louise Jane (the woman who believes ghosts in the library are reaching out), are well developed. The secondary characters, Josie’s parents, Connor (Lucy’s love), Blair, Stephanie, Grace, Mary Anna, and Sam Watson (local police officer) are a little more vague in their presence, but that is not to say this detracts from them as characters. Each has a role to play and Gates handles them well. If the other stories in this series are this enjoyable, they all belong in the reader’s library.